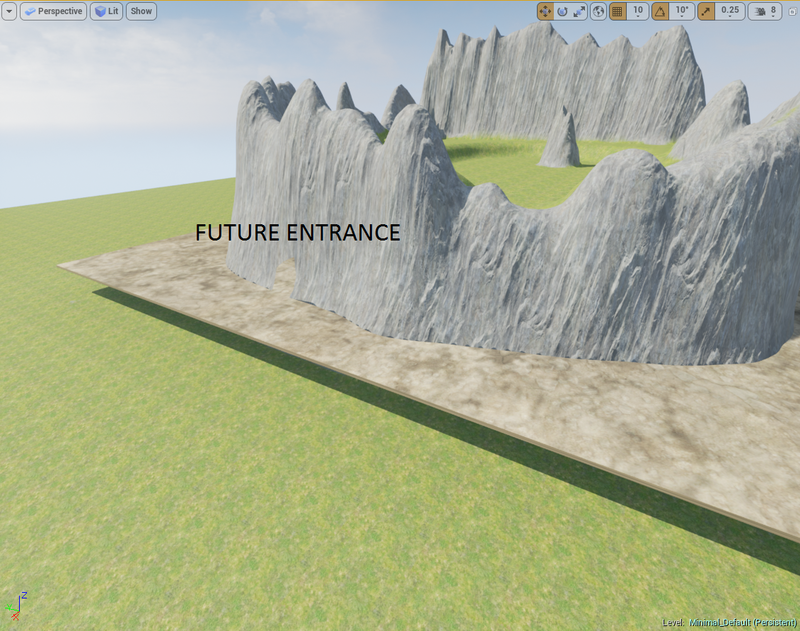 If I create a mountain with a cave entrance using the transparency painting tool, what is the best method to create a floor and wall static meshes that conform to the shape of the landscape interior? If I create a large static mesh cube for the floor as an example, the dimensions will stick through the plane of the landscape. Is there a way to cull this static mesh so that it doesn't extend beyond the limits of the landscape while using simple geometry? Here's an example terrain to show what I'm referring to more clearly. I guess in addition to this, are static meshes the correct way to accomplish the interior of such a cave? If I create a mesh floor in blender to import into this cave, how do I obtain the dimensions (from UE4) given that it would be a complex piece of geometry? Is there a tool in which I can get the inner dimensions of the cave? Effectively where the plane is intersecting in the first image. If I opt to use several pieces of simple geometry to fill the inside of the cave, how do you manage texture inconsistencies and stretching? I assume you would have to fill the cave with the smallest common static mesh possible to ensure the edges meet with a continuous texture? I guess the easiest answer is to create the inside as I want it and just ensure the outer limits are large enough to hide it all heh. For your first question, if you middle mouse button in one of the orthographic views you will be able to drag around a ruler. The measurements in the editor is 1uu=1cm so you can set your 3d modelling program to cm for accurate dimensions. For the materials, you can use a texture object and plug that into a world aligned blend node for what you are looking for. If you need an example of this look at M_Brickwall in the materials folder, it should be with your starter content.